The small population of Irrawaddy dolphins in Laos is now functionally extinct, the World Wildlife Fund announced yesterday. Only three Irrawaddy dolphins survive in Laos now, down from six individuals surveyed earlier this year, a recent survey by a WWF team found. The biggest threat to these dolphins is gill net fishing, and WWF urges Laos to extend the ban on gill nets to all parts of the Irrawaddy dolphin’s range. The small population of Irrawaddy dolphins in Lao People’s Democratic Republic is now functionally extinct, the World Wildlife Fund announced yesterday. Only three Irrawaddy dolphins are thought to remain in Laos now, down from six individuals surveyed earlier this year, a WWF team found. This tiny population is no longer viable, scientists say, because there aren’t sufficient potential breeding pairs of dolphins that can ensure survival of the population. 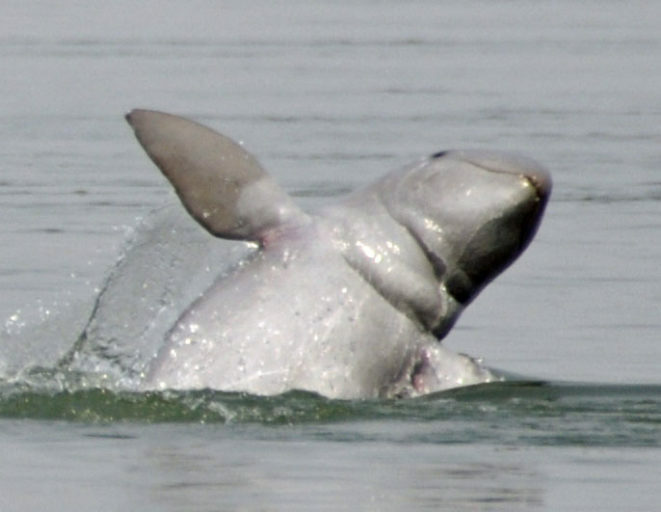 Irrawaddy dolphin in Mekong river, Kampi, Kratié, Cambodia. Photo by Dan Koehl. Source: Wikimedia Commons, licensed under CC BY-SA 3,0. The Mekong River subpopulation of the Irrawaddy dolphin (Orcaella brevirostris) in Cambodia and Laos has been declining steadily, and the subpopulation is currently listed as Critically Endangered in the IUCN Red List. 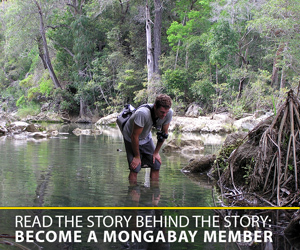 Fewer than 150 individuals were estimated to occur in the Mekong River in the early 21st century. But today, only 78 to 91 individuals exist in a 190km stretch of the Mekong between southern Laos and north-east Cambodia, according to the WWF. The three individuals in Laos, occur in the Cheuteal pool on the border between Cambodia and Laos. Many dolphins in the Mekong, especially calves, have died due to causes that are still unclear. Researchers are yet to determine if contaminants like DDT and PCBs may be killing the dolphins, or if there are other undetected triggers. But the biggest threat to these beluga-like dolphins is gill net fishing. These large bodied mammals frequently get entangled in the long lines of unmanned nylon gill nets that are hung vertically to catch fish, and drown as a consequence. Cambodia has banned the use of gill nets in the Mekong River. But in Laos, gill net fishing is prohibited only in the deepest parts of the Cheuteal pool off Hangsadam Village, where the dolphins usually reside. These nets, however, can be used immediately outside of the pool. So when the dolphins venture out of the pool, they run the risk of being trapped. Thousands of tourists visit the dolphin pools in Laos every year. In fact, dolphin-watching tours have more than doubled since 2008, according to WWF. So the disappearance of the Irrawaddy dolphins from Lao waters could significantly impact eco-tourism in the area, the team says. WWF urges the Laos government to extend the gill net ban to two kilometers radius around the Cheuteal Pool, expandable to four kilometers in the rainy season. 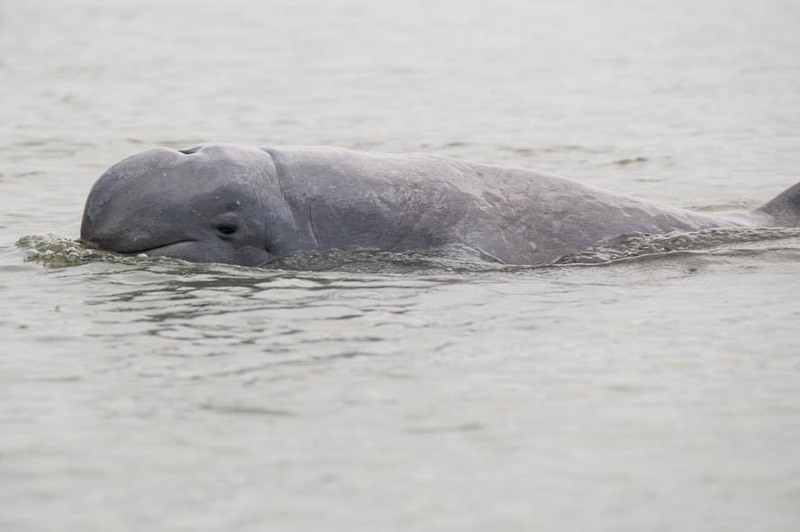 WWF also calls for increased enforcement of gill net bans in other Mekong River dolphin pools to protect the remaining dolphin populations. “The loss of this iconic species for Laos is even more tragic given that it was entirely preventable through strict enforcement against gill net fishing,” Seng said. Irrawaddy dolphins get frequently entangled in gillnets. Photo by Stefan Brending. Source Wikimedia Commons, licensed under CC BY-SA 3.0.